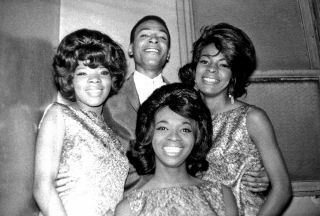 Marvin Gaye’s first musical foray into social justice was his composition of “Dancing in the Streets,” sang by Motown Records girl group Martha and the Vandellas. He co-wrote the song along with William “Mickey” Stevenson and Ivy Jo Hunter. The song was released in 1964 and became the theme of Freedom Summer, which occurred that same year (Kurlansky). Freedom Summer, which is also known as the Mississippi Summer Project, was a movement to register as many black voters as possible in Mississippi. The state had the lowest percentage of black voters in the Union, an injustice which implored many Northern activists to come to the state to register African-American voters (Erenrich 8). The headquarters of Freedom Summer was at Tougaloo College located in Jackson, MS, my alma mater. Berry Gordy, the founder of Motown Records, was an open supporter of the Civil Rights Movement, but he did not encourage his artists to make strong political statements. Because of that, Gaye did not speak on his specific inspiration for the song during the peak of its popularity. Kurlansky suggests Gaye worked around the non-political restrictions by borrowing from an old slave tradition. During slavery, blacks would sing songs that sounded like hymnals to their white owners but actually gave instructions for freedom to their breathen who could catch the implications. Kurlansky states that in African-American culture it is instinctive to listen for an indirect meaning of a song. President Obama was so enthralled with the effectiveness of Freedom Summer that he hired Marshall Ganz, a Freedom Summer alumnus, to be his campaign strategist for the 2008 presidential election. (NMAH) Ganz deemed the work done during the summer of 1964 to be the greatest grassroots method he had ever encountered. He decided to use the same template from Freedom Summer for President Obama’s presidential bid. Just as the summer of 1964 changed the landscape of America, the influence of “Dancing in the Street” would spark a change in Gaye and his artistic direction. Erenrich, Susie. Freedom Is a Constant Struggle: An Anthology of the Mississippi Civil Rights Movement. Montgomery, Alabama: Black Belt Press, 1999. Print. Kurlansky, Mark. “The History of the 1964 Motown Hit Song ‘Dancing in the Street’ by Martha Reeves and the Vandellas.” Markkurlansky.com. Mark Kurlansky, 2011. Web. 6 Apr. 2013. NMAH. “5 things to know about Freedom Summer veteran Dr. Marshall Ganz.” O Say Can You See?. National Museum of American History, 9 January 2014. http://americanhistory.si.edu/blog/2014/01/5-things-to-know-about-freedom-summer-veteran-dr-marshall-ganz.html. 23 March 2015.